We love crisp, refreshing, herbaceous cocktails here at Anchor & Den, which is why we crave a classic G&T – it is the perfect summertime drink! Our passion for gin has got us thinking, how can we escalate this love affair? We are proud to say we have the island’s largest collection with more than 23 unique and classic gins. Luckily for us, gin has seen a revival in the last few years. It perfectly suits our Apothecary-inspired cocktail program. Across Europe and the US, artisan distilleries have been producing traditional small batch gins with exotic botanicals. Over time these ingredients have become more and more adventurous with exciting versions to suit any discerning drinker’s palate. We have so much fun experimenting with all the nuanced flavours in different gin varietals and using novel garnishes, such as grapefruit, blackberry and rosemary, which mirror the individual gins’ botanicals. We are super excited to be unveiling our much anticipated Gin Booklet at our ‘All Things Gin’ launch event taking place on Friday, 19th May, featuring suggestions and recommendations on what we think makes the perfect G&T. From London Dry to New Western, we have a vast selection of different styles that we’re sure we have the right one just for you. 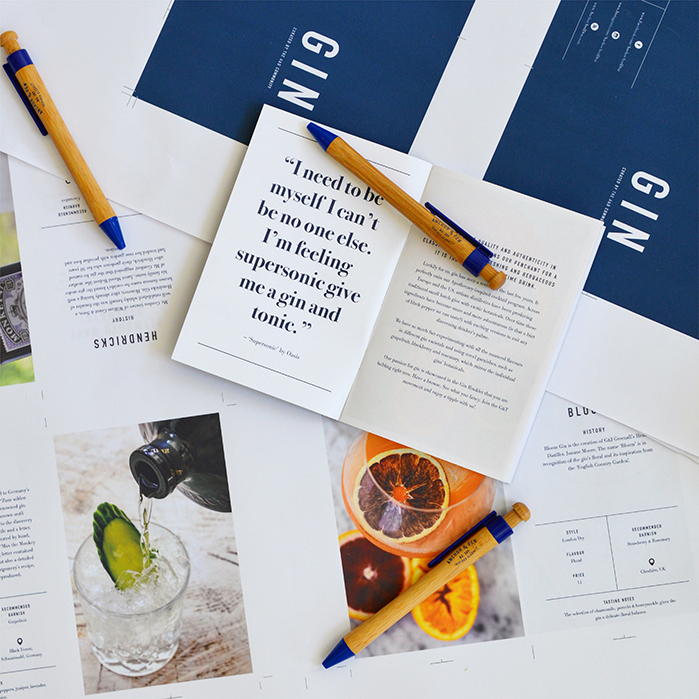 Our Gin Booklet will take you through a journey discovering the exciting stories behind each liquor including tasting notes, history and cool facts. From classic gins like Plymouth gin, which recipe goes back 150 years, to newer styles of gin like Corsair, which is a rum barrel aged gin (and is unheard of! ); this booklet is a perfect companion to your gin drinking experience. Join the party! For more information on our ‘All Things Gin’ event click here.